Kent Dealer, Kent Water Purifier Dealer, Saksham Kent Solution in Patna is best Kent dealer and repair service provider for Kent water purifier RO / UV machine like Kent Ace, Kent Maxx authorized dealer. Want to know Kent ro price in Patna of kent products like kent grand plus or looking for Kent service centre or details of kent customer care etc. We are not Kent authorized service centre and spare parts dealer but we repair and provide service for all type of Kent RO / UV and all kent water purifier machines in Patna. 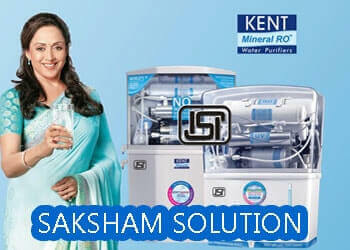 Saksham Kent solution has all Kent Water Purifier machines and its spare parts at discounted price for sell / demo and can provide service of Kent machines in Locations like Rajiv Nagar, AG Colony, Keshri Nagar, Patel Nagar, Shastri Nagar, Jagdeo Path, Anisabad, Kankarbagh and in all locations in Patna, Bihar. Saksham Kent Solution, Patna has experienced Kent trained service engineers which ensures the original spare parts and service quality and in time service response for Kent RO / UV / Water Purifier machines customers living in Rajiv Nagar Patna, Keshri Nagar, Shastri Nagar Patna, Anisabad Patna, Boring Road Patna, Kurji Patna, Rajbanshi Nagar Patna, Jakkanpur Patna, Danapur Patna, Phulwarisharif Patna, Boring Canal Road Patna, Kankarbagh Patna or any location in Patna Bihar. Kent water purifier machine is the best water purification technology in India which ensures the healthy and pure water which energises body parts and life. Water purification is must for all people living in Patna Bihar as the water we are consuming from different sources are not pure. There are so many companies in India which are in water purification industry and providing water purifier machines in Patna Bihar even at very low price. But Kent is using the best technology of RO / UV / UF water purification system which has already been tested by large number of people and has been chosen the best water purifier machine, best RO water purifier, Best UV water filter machine by people residing in Patna, Bihar. If you want to buy Kent water purifier machines, Kent RO machine or kent original spare parts in Patna or want to see demo of Kent Machines, you are welcome at Saksham Kent Solution in Rajiv Nagar, Patna or Call us at 8862821444 or 9122011989. If you are residing in any location of Patna like Rajiv Nagar, Shastri Nagar, Ashiana, Digha, Bailey Road, Boring Road, Kankarbagh or anisabad in Patna and using any Kent water machine then you can call Saksham Kent Solution in Patna for any service related issue. We are not Kent authorized service centre but we can make available kent original spare parts in Patna. Our Kent service engineers / technicians are technically strong and expert in Kent RO and water purifier Machine servicing. Saksham Kent solution Patna has more than 200 happy kent water purifier machine user clients in Patna and other cities of Bihar. We will be pleased to welcome you and your family to Kent Family in Patna, Bihar.